Hi friends! It’s Megan here from Two Delighted. For as long as I have been interested in home décor, I have found myself to be quite taken with collections of bottles. 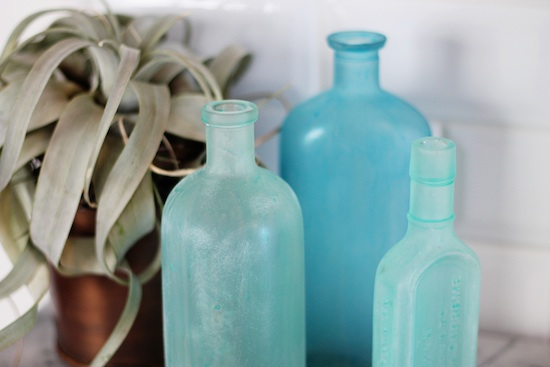 And primarily old vintage bottles in shades of green and blue. Have you guys ever tried to buy any? I can tell you for sure that they aren’t cheap. I vividly recall searching for green bottles for my sister’s wedding and wondering if there were possibly diamonds and gold hidden in them as well. That seemed like the only reasonable explanation to justify the substantial price tag. 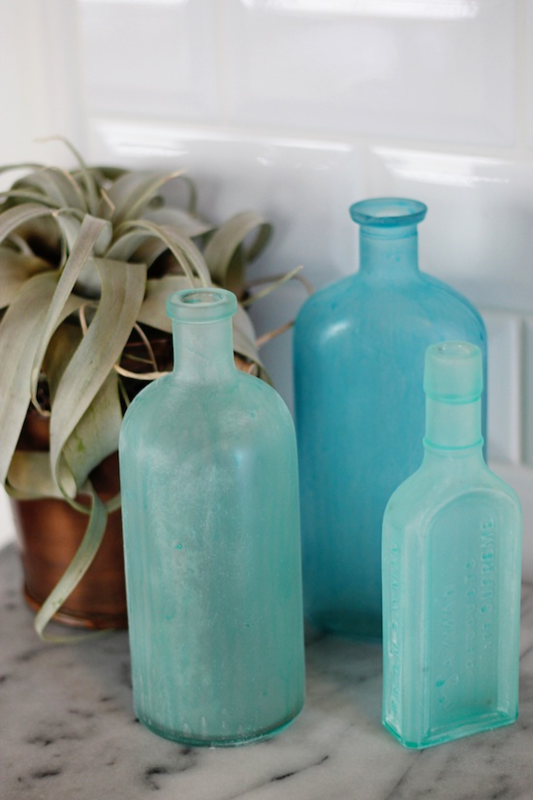 So with this in my mind and inspired by some of the opaque and weathered blue and green bottles I have seen that look as if they could have come from the sea, I decided to go about creating some of my own out of inexpensive clear glass bottles. Now let me say up front, if you only want one bottle like this, save yourself some time and just buy one. This is only really worth the effort if you are looking to have at least a few. If you want to just buy one, I recommend these - because they are attractive. 1. Glass Paint- I used Pebeo Vitrea 160 in Turquoise and Oriental Green after reading reviews and knowing that it is meant to be baked on which to me seems more durable. There are some less expensive glass paints that probably work just as well. 1. Make sure your bottles are clean and dry. 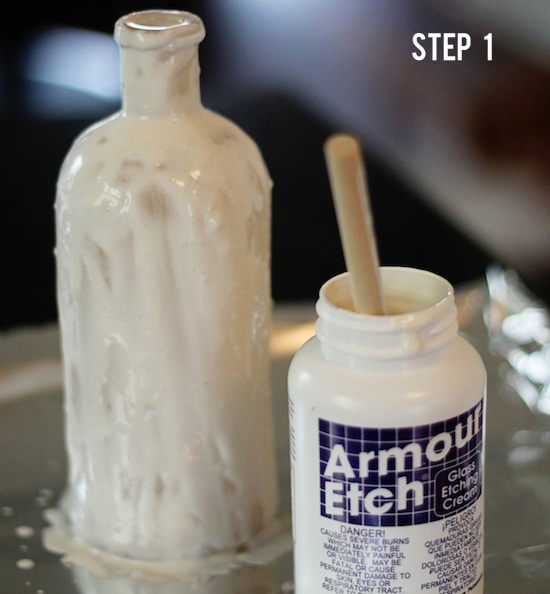 Grab a foam brush and start by applying a thick layer of the Armour Etch paste to the bottles. Be liberal because any spots without much on it will not etch well. I let the paste sit on the bottles for 15-20 minutes. Once it sits, wash all the paste off of it in the sink with just water. Let dry again and you will see that they have become opaque. It is not a problem if they are not all perfectly even. 2. 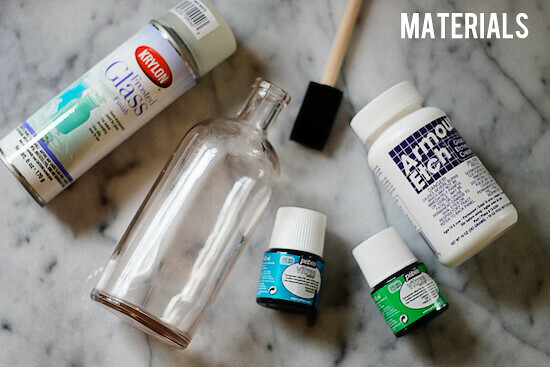 Once dry, mix a thick drop of your paint color with a splash of 100% acetone nail polish remover to thin. Colors can be mixed as desired to create the look you want. I had an extra glass bottle that I used for painting on to experiment with paint thickness and color. Once it is mixed and nice and thin, dip another foam brush in and squeeze out some excess paint before you start to paint each bottle evenly. I found that it is easier to build up color by adding more paint after the first coat dries if needed. Let your bottles dry for 24 hours(ish) before baking in the oven with the specifications from the bottle. I found this to be the most difficult part. Twenty-four hours is a long time to wait. When you bake them, place them in the oven before you turn it on and let the bottles warm up with the oven. Then, don’t remove them until the oven and bottles are completely cool which may take a few hours. If you are hasty, your bottles will crack and that would be sad. 3. 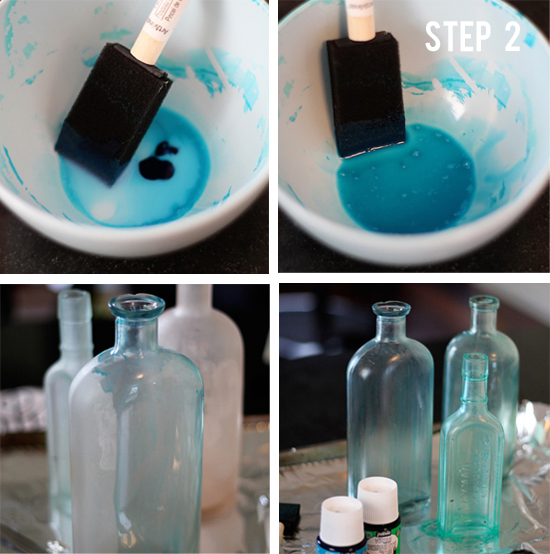 Use your frosted glass spray and spray evenly for the sea glass look. Let them dry. You can build up how opaque you want the bottles to be as well. 4. 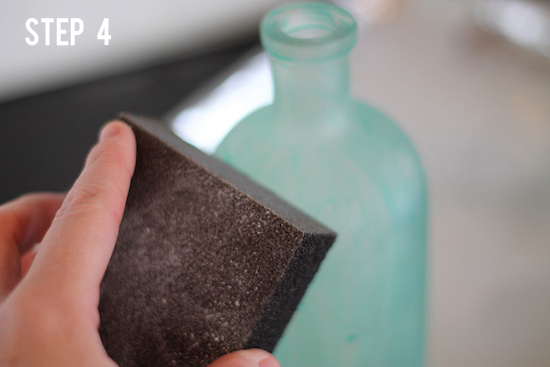 Take your sand paper or sanding block and very lightly sand small areas of the bottle to create a weathered look. I found that sanding in small circles looks better than in longer strokes. If you sand too hard, you can remove some of the paint. That’s it! This is a pretty easy little project that is not very labor intensive. The toughest part is the waiting in between steps. If anyone else tries it, let me know how it goes. I've been wanting to do this since I got that West Elm mini catalog in the mail the other week!! Pinning this SO HARD, thanks for the instructions! Yours look fantastic. Thanks!! I love the West Elm ones too! These are awesome! Def. adding it to my DIY list. Do you put the bottle upright in the oven or can you lay them down? Absolutely brilliant is right! I tried several methods and yours is the best! The bottles look fantastic! I just wish the etching cream wasn't so expensive. I tried going thinner with the etching cream and it's not worth it. Your method works best. Thanks sooooo much for your brilliant idea!